Envirox™ fuel borne catalyst is a scientifically and commercially proven diesel fuel additive which lowers fuel costs, by reducing fuel consumption, with a corresponding reduction in greenhouse gas emissions (CO2) and other harmful exhaust emissions. 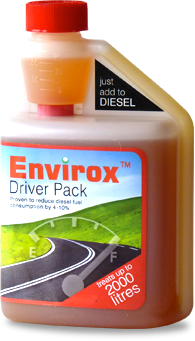 Envirox™ Driver Pack is a 500ml bottle which can treat up to 2000 litres of Diesel fuel. Each bottle features a 25ml dosing chamber; you simply pour Envirox™ into your fuel tank before refuelling with diesel fuel. 25ml will treat a tank of 50-100 litres. Envirox™ DPF Assist Multi Shot is a fuel borne catalyst formulation designed to help burn off the trapped soot particles that build up in DPFs. This can alleviate the problems associated with blocking – including expensive visits to the workshop – whilst saving money by guarding against worsening fuel economy.